Interested in opening a business in Uptown? Or perhaps moving or expanding into Uptown? We hope the guide below (click here for a printable version) will be helpful. We would also be glad to talk with you about available spaces and other questions you might have. Click here for a map showing the boundaries of the Uptown Shelby municipal service district. This district defines the area we represent and serve. Whether you are planning your first business or looking to expand an existing operation, Uptown Shelby is a great place to do business. The Uptown Shelby Association is a strong resource for local businesses in the historic Uptown commercial district at the heart of Shelby, a vibrant and attractive city of 20,000 located just 40 miles west of Uptown Charlotte. We’re also just over an hour away from Asheville and Greenville/Spartanburg, SC. That makes Uptown Shelby a great market for retail, restaurants, professional firms and personal service businesses. Uptown Shelby is a vibrant, historic business district that is at the center of the city of Shelby, the county seat of Cleveland County. Attractive live oak trees provide shade for wide sidewalks that accommodate sidewalk dining in a National Register Historic District. 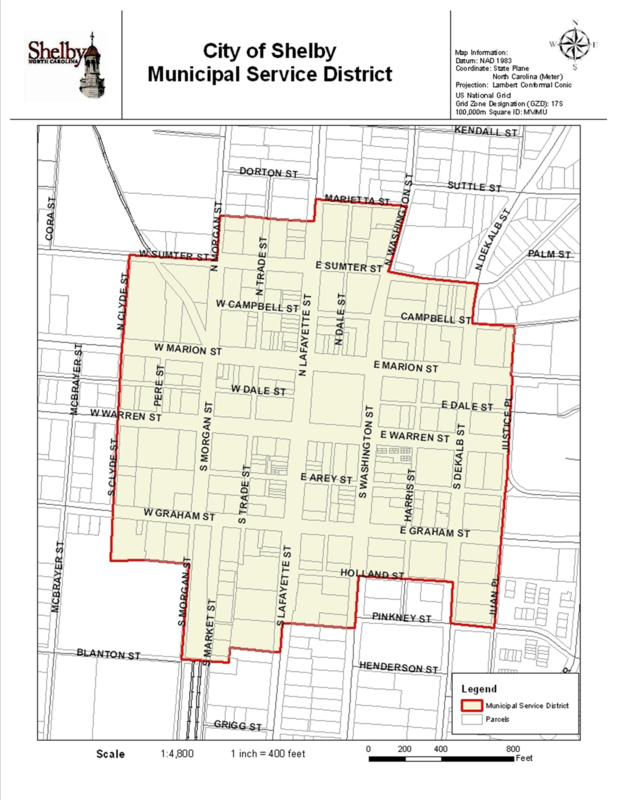 The Uptown district is recognized by the City of Shelby and centers on the historic Court Square, extending about three blocks in each direction. A map of the district and its boundaries is available upon request. In 2014, events and attractions drew over 65,000 people into Uptown. That number is expected to increase as more events are held in Uptown. Events include outdoor concerts, car shows, movie series, juried art show, fundraisers, 5k/10k races, festivals, art walks, parades, and holiday events. Attractions include the Don Gibson Theatre, the Earl Scruggs Center, the Cleveland County Arts Council, and the Foothills Farmers’ Market. Emerging sectors include tourism and data center enterprises, with important implications for all businesses operating within Uptown Shelby. Within a 50 mile radius buffer zone around Shelby is a broader market of 3,421,010 citizens, and some of our businesses are successful in developing customers from this area. We encourage retailers and hospitality businesses to become regional destinations as part of our efforts to differentiate Uptown Shelby and its advantages. Everyone talks about business plans, but too few businesses have a working plan to fall back on to help answer questions and guide them through change. We are big believers in writing a good business plan that needs to be updated once a year as part of an annual review of progress. Existing businesses can gain new direction and energy by working on a business plan to respond to a changing marketplace. If you understand why, but may have questions about how to develop your business plan, there are some important resources to use. The Small Business Center at Cleveland Community College can be your best place to learn how to write your own plan. Low-cost seminars are available for one evening or several days, and it is an excellent way to develop a network of people who share your commitment to building a new business. The Service Corps of Retired Executives (or SCORE) is a volunteer effort by some of the best executive talent in the nation, working under sponsorship by the U.S. Small Business Administration. There is a very good web site at www.score.org with a variety of resources for business owners, and a full suite of business plan and financial report templates that can get you started quickly at www.score.org/template_gallery.html#TOP. Uptown Shelby Association is prepared to help you find other resources to answer questions and provide guidance for business planning. We have an informal network of people active in business and we work hard to keep information flowing to help independent business in our community. Retail stores need foot traffic and convenient access in visible locations. Restaurants might need secure, lighted parking nearby as well as proximity to major employers. Professional firms need top grade offices and locations that are convenient, while personal service firms may need all of the above along with storage and work spaces. Whatever type of business you are looking to establish in Uptown Shelby, we can help you find the best location. Uptown Shelby Association does not represent property owners as brokers, but we do maintain a database of properties that are available. This information is only as complete as provided to us by either property owners or their agents. We will provide information that you or your broker can use to find the right space to lease or purchase. New business ideas are tested in many ways, but the single most important factor is the amount of financial capital that is available to start the business. The second point is the ability to generate profits. Here are a few resources to consider as you plan your new business in Uptown Shelby. The New Business Incentive (also known as the Rental Assistance Grant) from Uptown Shelby Association provides a monthly payment that ranges from $50 to $200 a month. The level of payment is based upon the rent, location of the business, and is paid directly to the business owner. Eligibility is limited to businesses based within the Uptown Shelby Municipal Service District area that have been open for at least six months. The program requires a written business plan, profit & loss worksheet, and a copy of the lease to be submitted along with the application form. The Economic Development Committee of the USA board reviews the applications and determines the grant amount. Request a copy of the New Business Incentive application packet by calling us at 704-484-3100. Businesses often find that an outdated store front hinders growth. Uptown Shelby Association has had a program that makes modest grants to help finance improvements to windows, doors, exterior walls and lighting. The Design Committee of our board of directors works with property and business owners to enhance the historic character where possible and boost the attractiveness of the district. USA will reimburse the owner for 50% of their costs, up to $2,500. Request a copy of the Façade Improvement Grant application packet by calling us at 704-484-3100. There are grant and loan programs available for small business that are ready to expand their operations. Programs exist under the US Department of Agriculture—Rural Development and the Small Business Technology Development Centers. Each specializes in working with different types of enterprises and their programs can be very competitive. In general these funders would want to see business plans and draft program descriptions before inviting an entrepreneur to seek funds through a competitive proposal process. Ask Uptown Shelby Association for referral to information or contacts if you believe these programs might offer potential for your business. Many banks have a dedicated SBA desk or team within their larger organization. Most banks can and do frequently participate in SBA guaranteed loans. The SBA specialist may have responsibilities for several localized markets, so it is important to ask for your bank’s specialist and make an appointment to discuss how the bank handles SBA loans. Banks, credit unions and other financial institutions can be very important sources for funding of your new business. Several of the major banks serving the area are located in Uptown Shelby. If you are new to the area Uptown Shelby Association can provide listings of business banking officers at all of the local institutions to help you get started. There are many good reasons to be sure that your business is legally sanctioned, inspected for the safety of your operations and promoting the safety and confidence of your customers. The general aim of government inspections and permits is to keep sound records for public safety, but they often help businesses avoid costly mistakes. Most business types are not required to obtain a business license from the City of Shelby, but permits may apply in some cases. Contact Planning & Development Services at the City of Shelby (704-484-6829) with questions. If a formal license is required by state law, initiate the licensing process early to avoid costly changes. The legal form of your business may have some impact on the need for licensing or registration, so legal advice could be valuable. All new tenants or the landlord must secure a change of tenancy permit from the City of Shelby to ensure that new businesses meet the requirements of the zoning designation for the property. The brief review process will indicate if zoning variances are required for the business to operate. Contact Planning & Development Services at the City of Shelby (704-484-6829). A permit fee applies. Zoning ordinances do influence the types and sizes of business signs that can be used. The rules strive to make signs readable to both drivers and pedestrians, but ensure safety. In recent years rules have changed to permit hanging signs that allow more creativity and visual excitement. Check with the Planning & Development Services office for details (704-484-6829). Changes to the internal and exterior features of a building will need to be approved by a Building Inspector from the City of Shelby. The inspection will cover a range of issues, but is primarily to ensure that the structure is sound and that basic systems comply with code. Contact Planning & Development Services at the City of Shelby (704-484-6829). An inspection fee applies. All businesses are subject to an initial Fire Inspection to ensure safe conditions are in place, as well as periodic inspections to maintain standards of safety. The Shelby Fire Department maintains an inspection office and can be contacted at 704-484-6418. Many of the safety issues will be covered in the building inspection process, but the fire inspection is required before a business may open to the public. Food service establishments may fall under regulation of either the local officers of the US Department of Agriculture (704-471-0235) or the Cleveland County Health Department (704-484-5100) for approval. North Carolina maintains strong control of licenses for the sale of alcoholic beverages through the Alcoholic Beverage Control commission in Raleigh. Local officers of the ABC and Alcoholic Law Enforcement agency will be involved in the process. Call the NC ABC Board with questions at 919-779-8326. The Shelby Police Department may also be able to provide some local information (704-484-6845). There are local ordinances that restrict the location of alcohol sales and the type of businesses that may serve alcohol. The best starting point is to describe the business and potential location to a staff member at the Community Development & Planning office first to be certain that a local permit is possible before going through the considerable time and effort of a state ABC license. Most businesses in Uptown Shelby will offer customer parking on-street or in city owned lots located around the district. Some privately owned parking lots are available by rental or agreement with the owner. Uptown Shelby Association is not involved in parking management, but we do encourage business owners and their staff to park in areas that do not use parking spaces in front of their own or other businesses that can be used by customers and clients. Businesses operating in the Central Business District will have different requirements for dedicated parking from other zoning districts. The underlying idea is that on-street and city-owned parking lots are available to absorb the additional parking that a new business brings to the district. That said, it is always a good point to ask the Community Development & Planning office in advance if the business you plan to locate in Uptown Shelby will face any requirements with regard to parking. When a new business is registered with Shelby Utilities for electrical, gas, water and waste disposal services, they will receive information on the pickup schedule and location where garbage should be placed. Wheeled bins are provided. Uptown Shelby Association, Inc. is a private non-profit that has been working to maintain and strengthen the Uptown business district since 1980. We are an accredited member of the national Main Street network that works to boost the vitality of historic downtowns and local businesses. A major part of our work is the active promotion of Uptown Shelby as the heart of our community and the economic engine at its center. Uptown Shelby Association updated its graphic identity and branding guidelines for marketing in 2014, notably distinguishing brands for the organization (immediate right) and for the district (far right). The large central block represents the Court Square and the way in which everything revolves around the strong history and harmony of the community space. The multiple colors, lines, and outer squares represent the diversity of the people, businesses, arts and culture that are a part of Uptown Shelby. The bright colors express the vibrancy and energy of Uptown Shelby, and the star in the district logo is a symbol of Uptown as a destination for everyone. The updated logo is part of an effort to define the Uptown Shelby district as a vibrant destination with entertainment, food, retail, services, and community gathering places. Local and regional outlets of various media types are used to promote the district. Uptown Shelby Association provides attractive banners to shops and restaurants to establish that each business is open and ready to do business. The Uptown Shelby Association stages special events, concerts, festivals and other gatherings that attract attention and draw visitors to our district. Live outdoor concerts, the annual Christmas Parade, horse-drawn carriage rides, and children’s activities are just some of the events that we host to draw people into Uptown Shelby. Some of these events are sponsored by area businesses and organizations. These events along with attractions and other events in the district drew over 73,000 people to the district in 2014 alone. That number is expected to increase as the events and attractions grow and as new ones are developed. Click here for a printable version of our Getting Started in Uptown Shelby guide.